The scenery was beautiful and peaceful. It was a mountain top that looked over a beautiful forest filled with creatures and stunning plants. The rock hard moutain top was scarred with cuts from blades, had some black spots from gun powder, and had bullet rounds from previous battles. But either way it was still beautiful. Hayato was meditating and relaxing at the top of the rock hard moutain, with his swords, Yin and Yang, by his side. He was very relaxed and waiting for one of the symbols, Zhao, to come. Hayato wanted to see how strong the Black Tortoise was, even though he was a symbol. Hayato then stood up and stretched. He then picked up his swords and shined them a little. Hayato then walked over the edge of the mountain top and said " This place is so beautiful. " Hayato had a smile on his face and placed the swords on his back in a crossed pattern. Zhao was surprised because Hayato wanted to have a friendly spar with him at the mountain top. So he went to the mountain to meet him. He brought his Water Blade to used it in there sparring. Even if I am a symbol Hayato is good in fighting. He said to himself with a nervous face. When Zhao reached the top of the mountain he saw Hayato waiting for him on the edge of the mountain top. "Hayato! Are you ready to have a friendly spar with me?!" He shouted to Hayato. 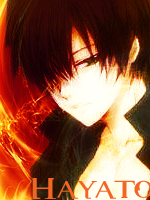 Hayato heard his name shouted and turned around to see Zhao standing there, he had a nervous look on his face. Hayato walked towards Zhao with a smile on his face and said " Of course I'm ready. Hayato then pulled out his katanas and continued The question is: Are you ready? Hayato then got in his fighting stance. He hadn't had a spar in a while and this would be good for him. It would keep the rust from his joints. "Your move, Zhao." Hayato said with that everlasting smile. Hayato had always wanted to test the style and skill of a symbol. He felt the rock underneath his feet, even in his geta sandals. "Ok! Let's have great fight Hayato." He said to Hayato with a smile on his face. Then Zhao pulled his Water Blade and started the sparring. He ran towards to Hayato and swing his blade on Hayato. "I wish this fight will be a history for us Hayato." He said to Hayato. "Here's for you Hayato! Water Dragon Bullet!" He shouted to Hayato. Zhao used his skill to Hayato. Hayato yelled "Alright." as Zhao swung at him. Hayato easily dodged the first swing by simply jumping back about 6 feet. The all of a sudden a dragon made of water was shot towards him. Hayato created some fire on the edge of the katana in his right hand, Yang, and sliced through it. After he sliced through it, it dispersed into mist. Thanks to Hayato's heightened senses and reflexes, he could easily tell where Zhao was in the mist. Hayato quickly appeared with his great speed on the side of Zhao. He was 3 feet away from his right arm and aimed a slice at it with Yang. He then put Yin under his armpit and jumped back, sending a fireball towards Zhao. When he landed, he was out of the mist, and he put Yin back in his left hand. He was about 10 feet away from Zhao. " Let's see how the Symbol responds." Hayato said with a slight smirk. After Hayato sliced his dragon he sensed that Hayato was at the side of him so he jumped above Hayato. Then he built a shield made of water and just waited for Hayato to strike again. Then he saw Hayato sending a fireball towards him saw he used his shield to defend his self. Then he used the mist for his next skill to be used. The mist became a Two-Headed Dragon for a offensive attack to Hayato. "Nice trick but here's for you!. Two-Headed Dragon!" He shouted. Then the dragon begun to spit a large volume of water towards Hayato and waited for what will Hayato do. Hayato quickly stepped to the right about 10 feet, as he could see the dragons and the water coming towards him. The water went right past him. Now Hayato had to deal with the two headed dragon made of water. Hayato ran towards the dragon with incredible speed and cut both dragons with one of his katanas. The katanas were so hard and strong that the dragons dispersed into regular water. The water dropped on the hard rock floor. Hayato did a sweeping motion with Yin and it let out a slash of fire. The fire was aimed for the water on the rock floor. When it hit it, it all dried up. The mist had finally dissappeared and they could actually see each other. Hayato put his katanas back into their sheaths on his back and said " That was a nice trick also. " Hayato then quickly shot out 10 blue hot flames out at Zhao in 1 second through punches. He then removed his katanas from his sheaths, as he removed them, he dried them with his sleeves in a quick motion. He then got in his fighting stance.